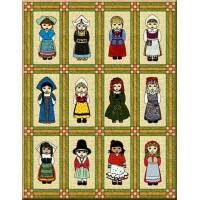 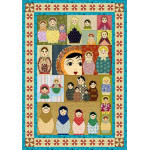 This fun appliqué wallhanging consists of a set of 12 European dolls depicting the traditional costumes of their countries. 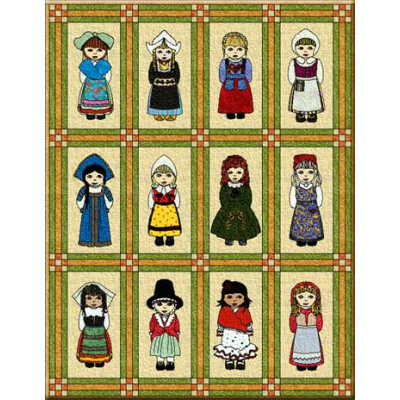 The countries represented are: France, the Netherlands, Germany, Finland, Russia, Sweden, Ireland, Norway, Italy, Wales, Spain, and Denmark. 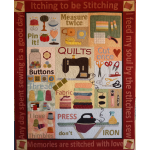 Make the project "as is" or pair up blocks for other projects! 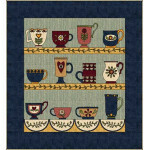 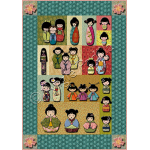 Finished size: 34 x 44"
This little wallhanging consists of a set of oh, so sweet and delicate appliqué country cups,..
Do you love and collect Asian fabrics ? 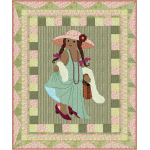 Then thiswall hanging will be right up your alley, offe..
We all did it at one time or another... sneak into Mom or Grandma's closet to try on her shoes and..